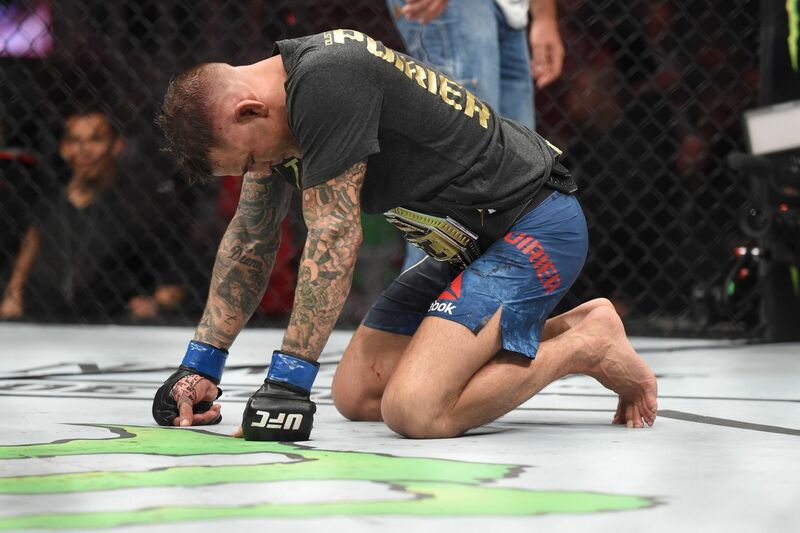 UFC 236 went down last night (Sat., April 13, 2019) from inside State Farm Arena in Atlanta, GA., which saw Dustin Poirier defeat Max Holloway after five rounds of intense action, winning the interim Lightweight title in the process (highlights). In the co-headlining act, Israel Adesanya defeated Kelvin Gastelum to capture the interim Middleweight title in a Fight of the Year candidate that had everyone giving them a standing ovation (see it again here). After 22 fights inside the Octagon, Dustin Poirier is finally a UFC champion. And he did it by defeating one of the best in all of mixed martial arts (MMA), piecing up featherweight champion Max Holloway in another wild scrap to secure a unanimous decision win. That is now two wins for Dustin over Max, which is a huge feather in his cap as he is the only man who is able to hold that distinction. For “The Diamond,” the victory not only gives him his first taste of UFC gold, but it propels him into the upper echelon moving forward, as no one can deny his place among the best MMA fighters on the planet. To top it off, he secures himself a big-money championship fight against 155-pound champion Khabib Nurmagomedov later this year. In his last four fights, Poirier has defeated Holloway, Justin Gaethje, Anthony Pettis and Eddie Alvarez. No other combatant can say they hold wins over all of those men, much less consecutively. Adesanya’s lighting-fast rise to the top of the division culminated last night after he won the interim belt after an absolute barn-burner of a fight against Gastelum. That is now six straight wins for “The Last Stylebender” inside the Octagon in a little over a year. Think about that for a second: Six wins on the toughest proving ground in just 14 months to win his first UFC title. That’s a tremendous feat, and now the 29-year old has pretty much silenced his last naysayer after that performance and locked down a title unification match against division champion Robert Whittaker. He also walked away with an extra $ 100,000 in bonus money. While it’s way too soon for this, Adesanya just opened up his path to superstardom by overcoming a very game Gastelum who was also seeking his first taste of gold. Israel was tested time and again last night, and when he needed to deliver the most, he did so by dominating the fifth and final round. To make matters worse, Eryk has gone up and down in weight in his last three fights, leaving him in an odd place in both the Middleweight and Light Heavyweight divisions. What his current losing streak means for Anders is unknown, but if he does get another shot inside the Octagon, he needs to pick a weight class and stick with it. To get full UFC 236: “Holloway vs Poirier 2” play-by-play updates and results click here. UFC Fight Night 146 went down last night (Sat., March 9, 2019) inside INTRUST Bank Arena in Wichita, Kansas, as the ESPN+ fight card saw Junior dos Santos knockout Derrick Lewis in the headlining act to earn his his third straight victory (see it again here). 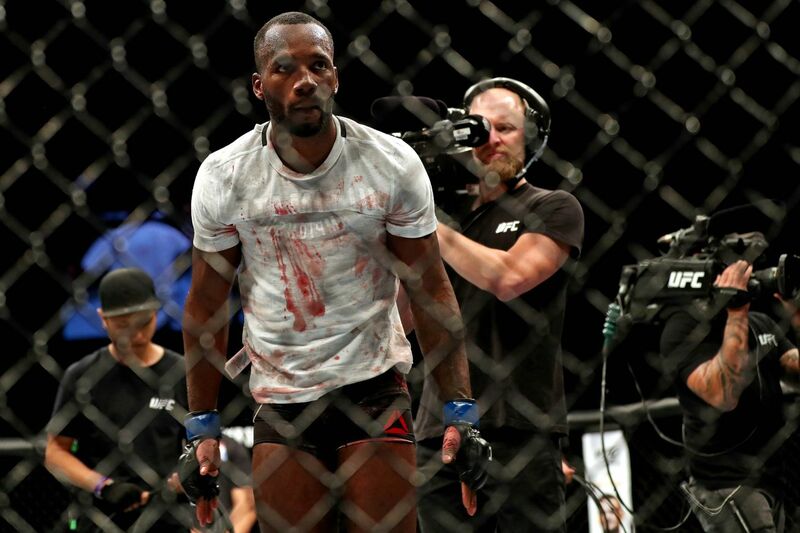 Also, Elizeu Zaleski dos Santos took out Curtis Millender rather easily in the co-main event, while Niko Price dispatched of Tim Means in an exciting Welterweight war (highlights). With the heavyweight division about to become a bit thinner with the looming retirement of division king Daniel Cormier, now is the time for the big men to start making their move to the top. And “Cigano” is doing just that, winning three in a row — two via stoppage. His win over “Black Beast” looked like vintage “JDS,” as he was light on his feet on swinging his haymakers with mean intent and accuracy. After a wild first round, Junior connected with a kick to the mid-section of Lewis, which left him wounded. Though Derrick tried his best to fight through it, even playing possum at one point, eventually Junior connected with a clean right hand and from there it was all she wrote. Now, “JDS” — who isn’t a big fan of Cormier vs Lesnar — has set himself up to jump up the rankings and make a case for a title shot, as he currently hold the longest winning streak in the weight class. Elizeu got his first big shot as co-main event, and he made the most of it, running right through rising contender Curtis Millender like a hot knife through butter. I mean it was surgical. That is now seven in a row for dos Santos, with his lone loss inside the Octagon coming via questionable split decision in his debut back in 2015. Elizeu should be saying hello to a top 10 foe in his next outing, and he should remain on the main card for the foreseeable future, as this man has truly an exciting talent with unlimited potential to make some loud noise in the welterweight division. Lewis looked to get back in the winner’s circle after being submitted by Daniel Cormier at UFC 230 in his previous outing. Unfortunately for Derrick, he ran into a highly-motivated dos Santos, who handed him his second straight defeat, the first time Lewis has suffered back-to-back losses in his mixed martial arts (MMA) career. The climb back to the title gets a bit tougher, as does a do-over against Francis Ngannou. On the bright side, Lewis has the power in his hands to end fights rather quickly, so racking up three or four impressive wins in rapid pace isn’t out of the realm of possibility, which means he can get back in the mix sooner, rather than later. But the possibility and risk of dropping three straight will weigh heavy on his mind in his next fight. For complete UFC Wichita results and coverage click here. Ultimate Fighting Championship (UFC) was back at it again, as the world’s leading mixed martial arts (MMA) organization invaded Moncton, New Brunswick, Canada for the first time ever to stage UFC Fight Night 138, which aired on FOX Sports 1, last Saturday (Oct. 28, 2018). 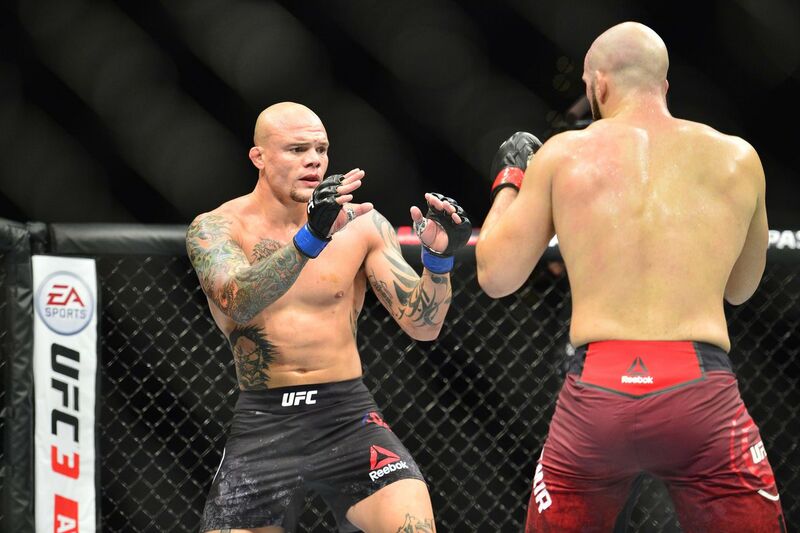 In the main event of the evening, Anthony Smith choked out Volkan Oezdemir in the third round in a thrilling Light Heavyweight affair (see it), while Michael Johnson took out Artem Lobov in the co-headliner (recap). “Lionheart’s” ascension up the 205-pound ladder took another huge leap last night after choking out former title contender Volkan Oezdemir in the third round of their scheduled five round main event fight. Since moving up to 205, all Smith has done is collect back-t-back first round knockout wins over Rashad Evans and Mauricio Rua, and then submit “No Time” in three rounds. What was impressive about his win over Volkan was the fact that he proved he can take some good shots and keep on ticking, as Oezdemir has Smith hurt in the fight. Still, Anthony kept his composure and rode the wave until he found his opening for the finish. Asking for a title shot after the victory, it will be a tough task to secure one as he is currently ranked No. 10. Still, you can’t score if you don’t shoot your shot. Misha picked up a much-needed win in Moncton, ending his two-fight skid after making quick works of Patrick Cummins. Indeed, Misha worked his way into a good position to lock in highly-impressive arm-triangle choke halfway through the opening frame. In doing so, he became the first man to ever forced “Durkin” to tap. The win means Cirkunov will remain in the promotion for at least a few more fights but now he can breath a bit easier without having to worry about a pink slip showing up in his inbox. Having competed for UFC since 2006, Herman, the longtime veteran had never suffered a three-fight losing streak. That is, of course, until last night, as Ed lost his third consecutive fight after dropping a razor-thin split decision defeat to Gian Villante in a rock em’ sock em’ type of fight. Since moving back up to 205-pounds, Ed has gone 1-4, which could signal another drop back down to Middleweight as banging with the big boys obviously doesn’t seem to be working for the longtime veteran. But don’t get it twisted, Herman only made this segment do to his three-fight losing streak, as that decision could’ve gone either way. For complete UFC Moncton results and coverage click here. Ultimate Fighting Championship (UFC) invaded T-Mobile Arena in Las Vegas, Nevada last night (Sat., Oct. 6, 2018) to stage a wild and crazy UFC 229 pay-per-view (PPV) event. In the headlining act, Khabib Nurmagomedov mauled Conor McGregor for four rounds before eventually sinking in a painful neck crank to force a tap (see it again here), holding on to his Lightweight title while handing Conor his second loss inside the Octagon. In the co-main event, Anthony Pettis and Tony Ferguson duked it out in a highly-entertaining scrap which eventually ended after Anthony’s corner threw in the towel and refused to let “Showtime” answer the third round bell due to a broken hand (recap). Irish gorilla, meet professional bear wrestler. Khabib did what everybody expected him to do to McGregor once he got his hands on him. He took him down, mauled him and eventually submitted him. But, to add insult to injury, “The Eagle” — the wrestling wizard — out-struck “Notorious” — the “professional boxer.” Khabib standing and trading with Conor caught most people by surprise, myself included. I figured if he decided to roll the dice and play that game, Khabib would be seeing stars. And boy did he prove me and everybody wrong, clipping Conor with a lighting quick strike that dropped him and had him retreating. What’s even more impressive is that Khabib not once got rocked, once again winning every single round. I’m not condoning or applauding Khabib’s post-fight antics, but sometimes in real life you really do rub up against people who are “really about that life” when you call them out and insult them in the media any chance you get. Artem found that out a few months ago, Conor and his camp did as well. And spare me the “post-fight brawl marred his win” talk. Had it been Conor, “is normal,” would’ve been the echoing statement because after all, he’s worth the trouble and the headaches. On several occasions, Alexander Volkov had “Black Beast” defeated, even taking a bizarre timeout in the opening frame to inform the referee that Lewis was either seriously hurt or admitting to a fish hook or an eye poke, Either way it had me puzzled. Later in the fight, Volkov once against had Derrick on the ropes but couldn’t finish the visibly exhausted brawler. But when your facing a power puncher like Lewis, it isn’t over until the fat lady sings. And with only a few ticks left in the fight, Derick unleashed a brutal right hand that floor the Russian, eventually clipping him two more times to knock him out cold and score a highly-impressive come from behind win (see it again here). I just can’t figure out if his comeback or his post-fight speech was the real MVP. The bully got bullied, plain and simple. Love him or hate him, Conor is good for the sport of mixed martial arts (MMA), as he brings eyeballs to the television set, butts to seats (even weigh-ins) and money to UFC’s bloated piggy bank. But, through all the trash talk, Conor simply didn’t have nothing to offer the bulldozer named Khabib, who had his way with him once the cage door slam shut. Even after “The Eagle” opted to stand-and-bang with him, “Notorious” couldn’t take advantage. It’s hard to call a man who is landing multi-million dollar sponsorship deals during fight week and scored an estimated $ 50 million check for his comeback fight a loser, but the loss will be a tough to swallow for the biggest name in MMA. On the bright side, despite all of the post-fight mayhem, we get to see a rematch. Because what Conor wants, Conor gets, regardless of potential legal hiccups. To get full UFC 229 play-by-play results and updates click here. Ultimate Fighting Championship (UFC) was back at it again, as the world’s leading mixed martial arts (MMA) organization invaded Sao Paulo, Brazil to stage UFC Fight Night 137, which aired on UFC Fox Sports 1 yesterday (Sat., Sept. 22, 2018). In the main event of the evening Thiago Santos picked up a huge win by knocking out Eryk Anders in a thrilling headlining bout. 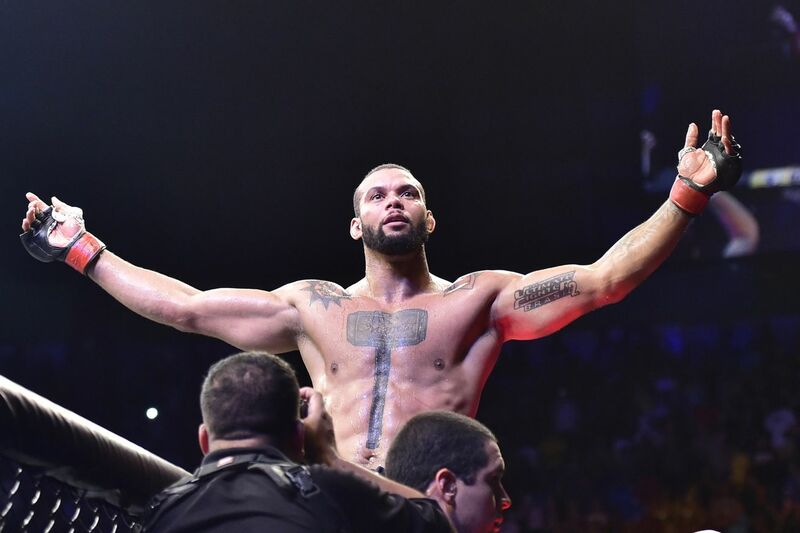 Despite not being the headlining bout UFC originally wanted, Thiago Santos and Eryk Anders put on a show for the Brazilian fans, as the two men let it all hang out from the opening bell. Despite fighting at 205 for the first time, Eryk hung tough against the streaking Santos. Indeed, Thiago hit Eryk with some solid shots, but Eryk Stuck in there, absorbed them and delivered some of his own. I mean they were cracking one another. Ultimately, Anders couldn’t answer the bell for the fourth round after he collapsed twice (see it) on the canvas at the end of the third thanks to some vicious elbows he was eating before the round came to an end. That is now two straight wins and six of seven overall for Thiago, who made good on his first-ever UFC main event, which was also his first fight at light heavyweight. Wherever he decides to fight moving forward, Santos will be trouble for anyone standing in front of him. It has been two long years since “Lil Nog” stepped foot inside the Octagon due to a failed drug test administered by USADA. But, Antonio breathed a huge sigh of relief after he was cleared of any wrong doing after lab in Brazil was blamed for distributing dirty pills. While his fight against Sam Alvey wasn’t the most technical, it got the job done, though you could see Nogueira’s ring rust. Still, once “Lil Nog” saw his foe wounded, he picked up the pace and stalked his opponent until he finally clipped him with a huge left and ended the fight with a few shots on the ground. That’s Nogueria’s first win since 2016, and now that he’s got his legs and a win under him, expect the Brazilian bomber to get back into the cage sooner, rather than later. What in the world happened to Lombard? He has now dropped six in a row in both the welterweight and middleweight divisions. His last win came in 2015, but that was overturned to a no contest after he was popped for steroids. So if we’re getting technical, Lombard hasn’t tasted (clean) victory since 2014. It’s a huge fall from one of the most hyped fighters to ever step foot inside the Octagon after running all over the competition in Bellator. What the future hold for Hector is unclear, but I would be surprised if his next fight is inside the Octagon. For complete UFC Fight Night 137: “Santos vs Anders” results and play-by-play, click HERE! Ultimate Fighting Championship (UFC) was back at it again, as the world’s leading mixed martial arts (MMA) organization invaded Moscow, Russia for the first time ever to stage UFC Fight Night 136, which aired on UFC Fight Pass yesterday (Sat., Sept. 15, 2018). 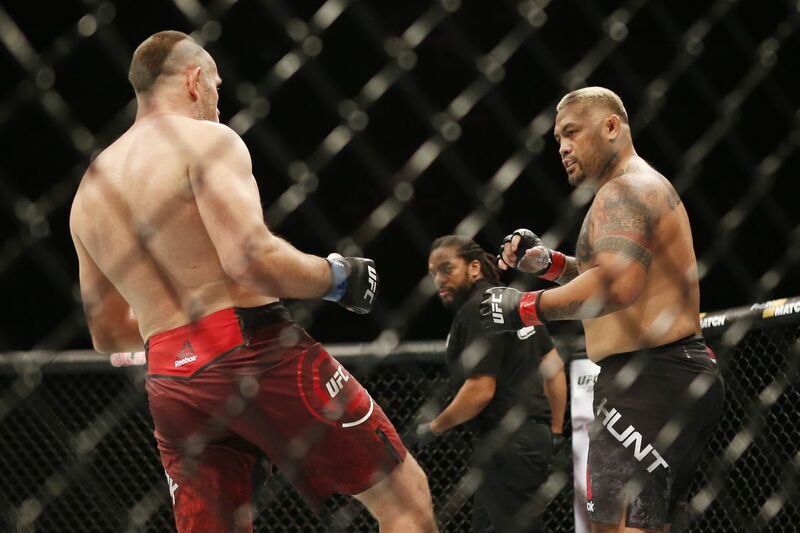 In the main event of the evening Aleksei Oleinik picked up a huge win, as he defeated Mark Hunt in Heavyweight action. Aleksei has slowly been climbing the ranks, but he’s been doing it quietly. His latest win over Mark Hunt, however, speaks volumes. That is now two straight wins for the submission specialist, winning four of his last five, with his lone loss coming to top contender Curtis Blaydes. The 265-pound landscape will change drastically in the coming months, as current champion Daniel Cormier will attempt to defend his title one time before he closes up shop. That said, Aleksei wants to make sure he’s in the thick of things when that happens. The win over Hunt helps, but he’ll need one more big victory to really get there. Nevertheless, he can enjoy his big win and look forward to an even bigger matchup in his next outing. Since losing to Patrick Cummins a year ago, Jan has been on fire, winning four in a row against some rather stiff competition, such as Jared Cannonier and Jimi Manuwa. Ranked No. 4, Jan is really starting to make some moves. His second-round submission win over Nikita Krylov was impressive to say the least, as Nikita was scorching prior to making his return to the Octagon. While Blachowicz isn’t the name that first comes to mind when looking at potential title contenders, he’s bullying his way through and people should start taking notice. With only Ilir Latifi, Volkan Oezdemir and Alexander Gustaffson ahead of him, Jan could very well over take one of those spots after his latest win. After losing to Misha Cirkunov at UFC 206 two years ago, Nikita opted to not re-sign with UFC, instead choosing to hit the regional circuit to improve on his game. And he did just that, wining four in a row during his time away. Feeling as if he was ready, he returned to the eight-walled cage as he stepped up to face a red-hot Jan Blachowicz. But, it went south in a hurry in the second round, as Jan sunk in a d’arce choke to score his fourth straight win. For Nikita, his last two fights inside the Octagon have seen him get choked out. Hopefully his latest defeat doesn’t doesn’t deliver another blow to his confidence. For complete UFC Fight Night 136: “Hunt vs. Oleinik” results and play-by-play, click HERE! Ultimate Fighting Championship (UFC) returned to the hurt business last night (Sat., July 14, 2018) with UFC Fight Night 133 from inside CenturyLink Arena in Boise, Idaho, live and free on Fox Sports 1. 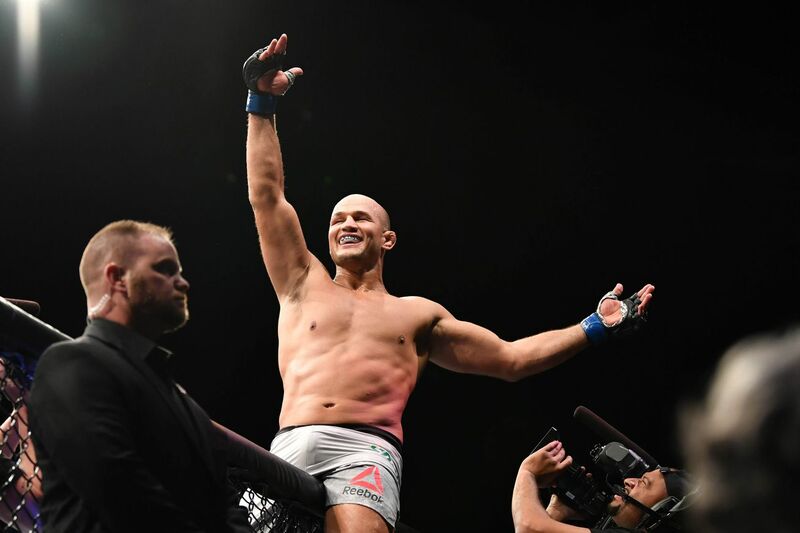 The event saw Junior dos Santos defeat Blagoy Ivanov via unanimous decision after five rounds of main event action (recap). In the co-main, event, Sage Northcutt stopped Zak Ottow to earn his third straight win at Welterweight. 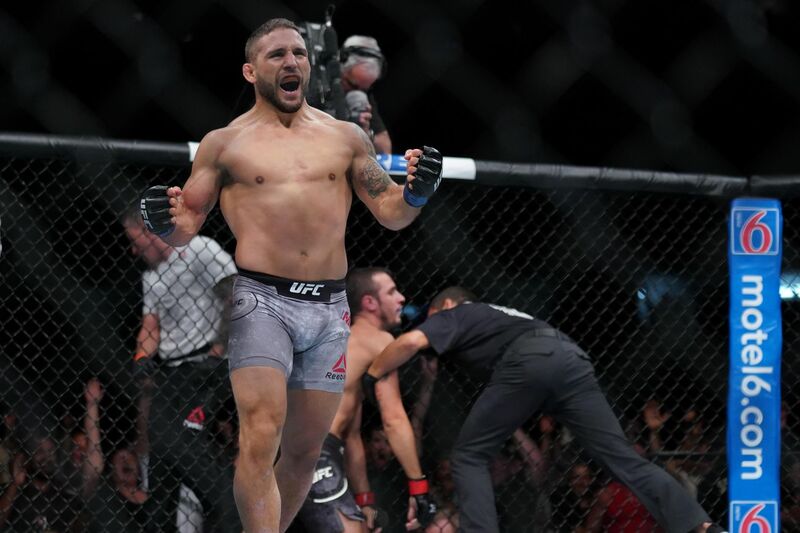 Two years on the sidelines due to a fail drug test administered by USADA didn’t do anything to slow Chad Mendes down, as “Money” looked like he hadn’t skipped a beat in his first fight back against Miles Jury. Halfway through the opening round, Chad clipped Jury with a sneaky left that dropped him. What ensued was a vintage Chad Mendes ground-and-pound beatdown, as he took it to Jury until the ref had no choice to put an end to the punishment. It’s a huge victory for “Money,” which also netted him a cool $ 50,000 in “Performance of the Night” honors. His return also bolsters up the Bantamweight division, which at the moment seems to be a three-man game of musical chairs with T.J. Dillashaw, Cody Garbrandt and Dominick Cruz. While he may need a few more wins before he gets back “into the mix” when it comes to the title, I’m willing to bet Mendes can get there pretty quick since he’ll likely want a quick turnaround. Don’t look now but “Super” has his first three-fight win streak inside the Octagon, as the young, up-and-coming up star is starting to finally find his groove after settling on the Welterweight division. And he scored his latest win by showing he can overcome adversity. After getting dropped in the first round, which initially looked like he’d be out, Northcutt shook off the cobwebs to storm back and score a stoppage win in the very next round. Though he is still a long way from title talk, Sage has shown vast improvements since making his debut a few years ago. If he can secure a few more wins, we can see Sage climbing the ranks sooner, rather than later, and starting forcing himself into the title conversation. Furthermore, it seems his move to Team Alpha Male has proven to be a recipe for success. That, and he’s no longer bothered with school work. I don’t mean in that Dennis got worked, but his split-decision defeat to Rick Glenn was his fourth straight loss inside the Octagon, which could put his UFC career in danger. It seems like it wasn’t too long ago that he was riding a seven fight win streak spanning two years, even defeating Max Holloway during that span. But over his last eight fights, Dennis has lost six of them including his current skid. Where he goes from here is anyone’s guess, but Bermudez’ future inside the Octagon is definitely now in limbo. Where it all went wrong for Dennis is unknown, but he better right his ship before it drowns just in case the promotion wants to give him one more try to get back into the win column. It’s an opportunity he may get seeing as how the decision was highly-questionable. Ultimate Fighting Championship (UFC) returned to the hurt business last night (Sat., June 23, 2018) for UFC Fight Night 132 from inside Singapore Indoor Stadium in Kallang, Singapore, which was headlined by a Welterweight bout which saw Leon Edwards bust up and outlast Donald Cerrone on the headlining act. In the co-main event, Ovince Saint Preux scored a first round, come-from-behind submission win over Tyson Pedro. If you can talk the talk and walk the walk, you will have a bright future inside the UFC Octagon. And Edwards has talked the talk to the point that he pissed off “Cowboy” with all of his chatter leading up to the fight. But “Rocky” walked the walk, dominating Cerrone for five rounds to earn a unanimous decision win and Donald’s respect. That is now six straight wins for Edwards, who will likely move up the rankings and get closer to his quest for the title. Leon proved he is the real deal and a force to be reckoned with in the division. “OSP” got back on the winning track after stopping a surging Tyson Pedro via straight armbar in the opening round. What makes the victory more impressive is that he had to fight back and shake the cobwebs after getting caught earlier. It’s a huge win for Ovince as it gets him back in the win column after getting taken out by Ilir Latifi. Ovince has the tools to be great, he just needs to put them together on a more consistent basis. Donald Cerrone is back in the losers column again (it’s odd to say that). After starting his Welterweight run with four straight wins, Cerrone has now lost 4 of his last five matches. It was a long, hard-fought battle against a young up-and-comer, but alas it seems “Cowboy” couldn’t’ really get anything going due to his sickness. Cerrone simply hasn’t been able to pop offense as he’s done in the past, so it’s obvious the young up-and-comers are starting to be a bit too much for the longtime veteran. Perhaps matching him up with an aging veteran such as himself seems like a logical step. For complete UFC Fight Night 132: “Cowboy vs Edwards” results, including play-by-play updates, click here. Ultimate Fighting Championship (UFC) returned to the hurt business last night (Sat., June 9, 2018) for UFC 225 from inside United Center in Chicago, IL, which was headlined by a Middleweight bout which saw division champion Robert Whittaker and Yoel Romero go to war for 25 minutes in a non-title fight. In the co-main event, Colby Covington defeated Rafael dos Anjos to claim the interim Welterweight title (recap here). Love him or hate him, Covington got the job done after taking the win over former Lightweight champion Rafael dos Anjos. The win not only gave him his first-ever UFC strap, but proved once again that “Chaos” can walk the walk after talking the talk…repeatedly. While we’re not 100-percent sure President Trump will host Covington in the White House, we know a title unification bout against division champion Tyron Woodley is definitely on the horizon. And “The Chosen One” is ready to get it on as soon as possible. Ladies and gents, we have a new, legit contender in the land of the big men as Curtis Blaydes has now won six in a row including his devastating and bloody knockout victory over Alistair Overeem in “The Windy City” (see it again here). Prior to that, “Razor” has taken out Mark Hunt Oleksiy Oliynyk. In fact, Curtis’s lone loss came to Francis Ngannou back at UFC 216. But that loss was due to a doctor’s stoppage. Still, a loss is a loss, but Curtis has proven to be the real deal and a man who is ready to implement himself in the thick of the title pictures. And while he was quick to call for a shot at the title, he has to wait and see how everything plays out between division champion Stipe Miocic and Daniel Cormier next month at UFC 226. What was supposed to be a bounce back fight for the former Light Heavyweight champion of the world proved to be anything but, as “Suga” suffered a first-round knockout loss to Anthony Smith thanks to a well-placed knee to the face. That is now five straight losses for the ex Ultimate Fighter (TUF) winner. It truly is a tough fall from grace from the former champ, with really no explanation. But, it happens to the best of them, and now we wait to see what becomes of Evans after his latest setback. For complete UFC 225: “Whittaker vs Romero 2” results, including play-by-play updates, click here.